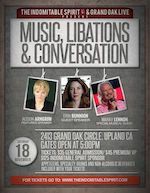 The Indomitable Spirit and Grand Oak Live have teamed up to bring you Music, Libations and plenty of Conversation. Alison Arngrim, co-producer of The Indomitable Spirit, will be the featured speaker/entertainer of the evening. The Indomitable Spirit is also very proud to introduce Erin Runnion, founder of the “Joyful Child Foundation,” as our very special guest. And, last but certainly not least, anyone who’s ever been to a Grand Oak Live concert, knows the best.singer.on.the.planet – Marky Lennon, accompanied by his brother Michael Lennon on guitar, and bass guitarist Mark Harris. Marky lends his unbelievably FABulous vocal talents to entertain us throughout the evening. $35.00 General Admission – Thanksgiving dinner, alcoholic drink special and all non-alcoholic drinks are included with your ticket. $50.00 Premium VIP – All of the above plus Premium Seating, one FREE raffle ticket and an invitation to the private meet-and-greet after-party. $125.00 Indomitable Spirit Sponsor – All that’s offered with the Premium VIP except, instead of ONE free raffle ticket, you get THREE free raffle tickets, plus a goody bag loaded with all sorts of fun stuff – like CDs, tickets to the Grammy museum and our invitation for you and a guest to attend up to TWO Indomitable Spirit events during 2018. And, your name (or your company’s name) will be listed on all Indomitable Spirit brochures as a sponsor. Grand Oak Live is known for its concerts under the stars. The uniqueness of their setting, coupled with the extraordinary talents of their guest musicians, make a concert at Grand Oak Live an unforgettable evening of entertainment. Raffles • giveaways • awesome speakers • a Thanksgiving feast • specialty alcoholic drinks • nonalcoholic beverages • fantabulous music • and Nellie Oleson herself… What more could you want? We look forward to seeing you on Saturday, November 18th!